Scholarly and public interest has been overwhelming. Reaching across boundaries from the academic to the political venues, the project addresses complex issues that have a profound resonance in the archaeological world and, at the same time, it speaks to the hearts and minds of large segments of the public. We have seen this in the remarkable string of venues were we have been called to present our project. The level of interest is well documented by the large number and the extreme variety of our presentations. Particularly significant were those highlighted below in bold face, both because of the number of people in attendance and because of the high quality of the event. The reception has been enthusiastic everywhere. It literally brought tears to some, because of the starkly unique image cast by the work being done in Mozan. “Urkesh, open city” echoes the title of the famous Rossellini movie. I choose it to echo the sense of strength and hope that the film evoked. I will list here the events in which various members of our staff have been engaged, from mid 2012 until the end of 2013, and I will anticipate the major events planned for 2014. 1. May/June 2012: three scholarly papers presented at two international congresses in Warsaw and Berlin, and at the University of Frankfurt. 2. September 2012: four major scholarly papers at the Russian Academy of Sciences in Moscow. The Director General of Antiquities and Musems, Dr. Bassam Jamous, was invited but was unable to attend. The Director of Antiquities from Hassaka, Dr. Abdel Mesia Bakdou participated. 3. October 2012: a scholarly paper presented at the American Schools of Oriental Research in Baltimore Maryland. 4. November 2012: two workshops at the Politecnico University in Milan and at the Ambrosiana Gallery in Milan. Gulfsands’ CEO and President, Mahdi Sajjad, and the Commercial Director, Kenneth Judge, participated, as well as Mr. Marwan Midani (formerly of Souria Holding), Mrs. Leila Kabab (of Total) and Msgr. Antranig Ayvazian (from Qamishli). 5. December 2012: a paper at the University of Florence and a presentation in London to the Directors and Management of Gulfsands. 6. January 2013: a presentation at the Archaeological Institute of America in Seattle and at the Cotsen Institute of Archaeology in Los Angeles. 7. 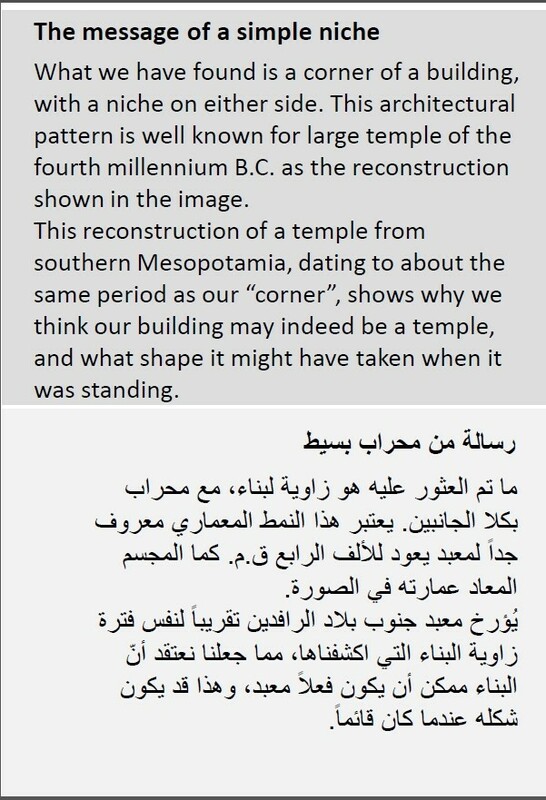 February 2013: a presentation at a meeting called by UNESCO in Amman, Jordan, on the preservation of Syrian antiquities. The participants included the Director General of Antiquities and Museum from Damascus, Dr. Maamoun Badel Karim, four other archaeologists, and a number of representatives of customs and police officers in charge of controlling smuggling activities. 8. March 2013: presentations at New York University and the Catholic University of America. 9. April 2013: presentation at an international meeting organized by the National Geographic Society for the Government of Guatemala in Guatemala City. The meeting catered to a very large public audience, and it marked the first time (since the end of the civil war) that leaders of the native Mayan community appeared in public on the same podium along with two ministers of the Guatemala government and with the Vice-President of the National Geographic Society. 10. May 2013: a paper at Rome’s Università Tre. 11. June 2013: A paper sponsored by the Georgian Academy of Sciences and held at the National Museum in Tbilisi, Georgia. 12. July 2013: a presentation at a meeting on the Syrian situation called by the Italian Minister of Defense, Mario Mauro, where, in addition to the Minister, there were the Vice-President of the European Parliament, an undersecretary of the Italian Ministry of Foreign Affairs, two ambassadors, and a member of the European Commission. I was the only academic on the panel. 13. August 2013: two presentations at the International Meeting for Friendship among People in Rimini. This is one of the largest cultural events in the world, with about 800,000 attendances during an entire week. This year it was inaugurated by Prime Minister Letta. Our presentations were in front of an audience of almost 900 people each. 14. September 2013: a one week intensive course at the Iraqi Institute for Archaeological Conservation at Erbil. This was organized by the World Monuments Fund on behalf of the US State Department. It provided an indepth review (five hours a day for six full days!) of our project to a restricted and highly selected audience of Iraqi archaeologists. Among them were the four directors of the Babylon project, the most important preservation effort undertaken by the Iraq antiquities department. 15. October 2013: two papers at a meeting of the prestigious Accademia dei Lincei in Rome and at the University La Sapienza of Rome. 16. November 2013: a paper at the University of Venice, Italy, and a presentation at the Musée d’Art et d’Histoire in Geneva, Switzerland. 18. 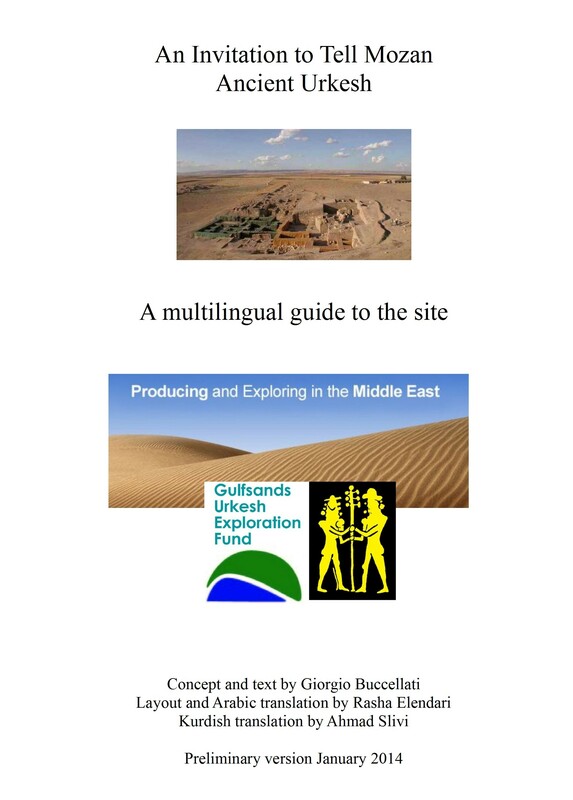 June 2014: plans for a second course presented at the Iraqi Institute for Conservation in Erbil (a continuation of the one offered in September 2013), preceded by a presentation at the Iraq Museum in Baghdad, organized by the Italian Embassy. 19. August 2014: plans for a major exhibit on our project at the same Meeting in Rimini where we gave presentations in August 2013, to which the Gulfsands CEO and President and Gulfsands’ Commercial Director have expressed their intent to participate. Also, the Director General of Antiquities and Museums from Damascus, plus three Directors of Antiquities of the regions of Aleppo, Idleb and Qamishli have already accepted our invitation to participate. 20. September 2014: a presentation at the Archaeological Film Festival in Rovereto, Italy. This is one of the world’s largest events for archaeological film. Even though we will not present a film, they have asked ask to offer a special session devoted entirely to our project. Syrian multicultural identity is rooted in history. Urkesh is witness to this. It was a thriving hub of Hurrian culture at the time when Ebla and Mari were dominant centers of Semitic culture and when Sumerian was prevalent throughout the country as the lingua franca for administration. It is so today, as well. The one-sidedness of extremism would want us to believe otherwise in today’s conflictual situation. But it is not so. The hope for tomorrow is rooted in the healthy reciprocal respect that defined Syrian culture yesterday. The openness with which foreigners like ourselves have been warmly welcome at all bears testimony to this. I am fond to say that the Syrian adage “My home is your home” has acquired an even greater depth when it comes to mean “Our history is your history.” It is in this spirit that we, the archaeologists, feel like a catalyst for unity, never like outsiders indifferent to the present. Archaeology in general, and Urkesh in particular, have contributed to this in the past. The year 2014 marks the thirtieth anniversary of our presence at Mozan. In all these years, we have not had one single incident relating to ethnic conflict. And yet we have constantly integrated every such identity in the routine of our work, with intentionally mixed crews and open channels to all communities. In recent years, we had been planning to develop a more explicit outreach to the Kurdish community. We began with a guided tour to the grammar school children, to whom our explanation were translated from English and Arabic into Kurdish. We wanted to expand our signage system so that it would include portions in Kurdish as well. We were interrupted by the sad turn of events. But we have now resumed this effort, and even from a distance we are putting together a multilingual booklet of which the next two pages offer a sample. Some 50 pages long, it describes the salient features of the excavations and helps the visitor understand the value of the past and its meaning for the present, in all its facets. Its realization wants to offer another indication of our commitment to continuity in the midst of the anguished interruption that Syria is suffering – and that we are suffering from a distance. It is precisely the intent to overcome this distance, with whatever means are available to us. We, the archaeologists, want to welcome afresh the new visitors to the tell even as we cannot be there to greet them in person. On July 25th, 2013, a Mozan staff member, Eliana Iorfida, received a national award for her novel Seven Pairs of Shoes. 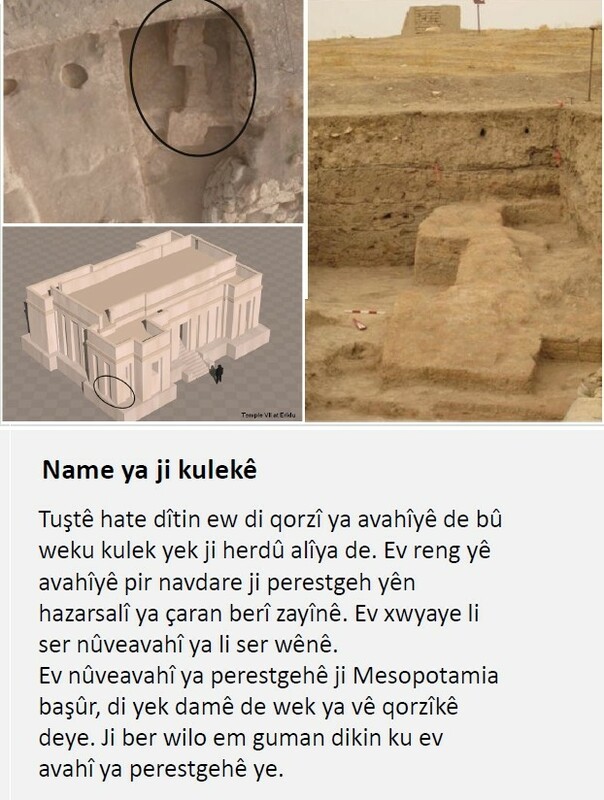 It is a moving story based on her participation in our excavations at Tell Mozan. It narrates the encounter of a young Syrian girl coming back from Lebanon to her mother’s village, next to the site of Tell Mozan, and discovering what archaeology had meant for the village and its inhabitants. The book will appear in print in April 2014. You can read more about it in (http://www.premioletterariolagiara.it/libri/eliana-iorfida/sette-paia-di-scarpe). The book opens a wide window onto the relationship between the past and the present, but also about the impact that a group of foreign scholars can have on the local perception, the people’s perception of themselves and the perception of what the undiscovered past hiding in their backyard can mean for their personal and collective sense of self-identity.